The evidence and recommendations about breast cancer screening mammography can feel confusing to many women. Over the past several months, we’ve published several pieces about mammography screening. We published a piece in the Huffington Post about the mounting evidence that mammography screening does not, in fact, “save lives” and our op-ed arguing for the radical re-thinking of the flawed philosophy behind the ‘early detection’ mantra that dominates the breast cancer awareness movement was published in The Guardian. In May, we hosted a webinar featuring Dr. Anthony B. Miller, Professor Emeritus of the University of Toronto’s Dalla Lana School of Public Health and lead author of one of the largest studies on screening mammography to date, the Canadian National Breast Screening Study. Currently, our work on primary prevention of breast cancer is centered on the regulation of toxic chemicals linked to breast cancer. Things definitely heated up this spring around reform of our broken and outdated chemical regulations. One effort, the introduction of the Chemicals in Commerce Act (CICA) was an absolute gift to the chemical industry. CICA scales back the Environmental Protection Agency’s (EPA) authority to regulate or require testing of new chemicals, allows companies to mask the identity of a chemical linked to toxic health effects, and could overrule stronger existing or future state chemical laws. Procter & Gamble, to name but one corporation, testified in favor of CICA. P&G also manufactures and markets products sporting pink ribbons during Breast Cancer Awareness month each October. Hmmm! Imagine that. A huge, highly profitable corporation that sells pink ribbon products supporting legislation that allows them to manufacture products that contain chemicals linked to an increased risk of the disease! We have a name for that–pinkwashing–and we aren’t afraid to use it! Speaking of huge, highly profitable corporations, Avon announced this spring that they’ll remove a hazardous chemical, triclosan, from their line of cosmetics and personal care products. Hooray? Not so fast! While this announcement is certainly a step in the right direction, it is also too little, too late. And we wrote about why. Other huge corporations like Johnson & Johnson have already made similar and stronger commitments, eliminating triclosan as well as other chemicals of concern from their products as well. 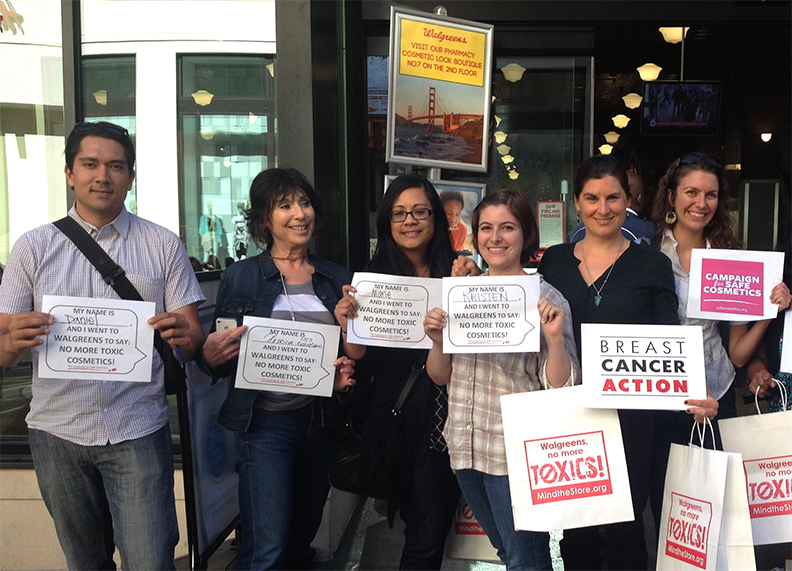 We helped tell Walgreens to Mind the Store by getting toxic products off their shelves. 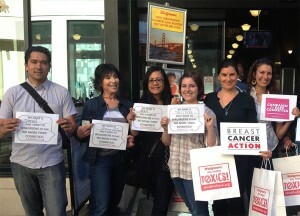 In April, the Safer Chemicals, Healthy Families Coalition’s Mind the Store campaign really got activists out on the streets. We’re proud to be a member of this coalition, and here in San Francisco we paid a visit to our local downtown Walgreens for some good old-fashioned direct action demanding that Walgreens stop selling products that contain hazardous ingredients that threaten our health. Also in April, we took action alongside communities in Wyoming, Texas and Pennsylvania whose water is contaminated with hazardous chemicals from nearby fracking operations. Along with anti-fracking activists from across the country, we’re demanding that the EPA Administrator Gina McCarthy re-open their investigations into drinking water contamination – because everyone deserves non-toxic drinking water. If you are interested in how researchers actually study environmental links to breast cancer and develop improved methods for identifying toxic chemicals and you weren’t able to make our webinar in June with Ruthann Rudell from Silent Spring Institute and Megan Schwarzman at the University of California, Berkeley School of Public Health then catch up now by watching the webinar online here. We welcomed two new members to our Community Leaders for Change program in the last few months, Jeanette Koncikowski from New York and Ilsa Flanagan from Illinois. For more information about the Community Leaders for Change program or to become a Community Leader, please contact Sahru Keiser at 415-243-9301 x14 or skeiser@bcaction.org.